There are a wide number of uses for your Dremel rotary tool.  This is a great craft to put your Dremel rotary tool to good use, use it to recycle and decorate an old glass jar. 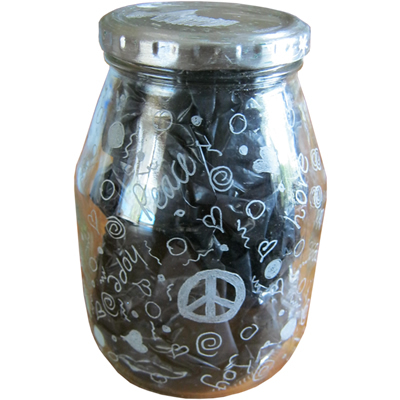 Follow our easy step by step instructions and see how easy it is to make your own upcycled Dremeled Glass Jar! You will start by washing out and drying that old glass jar. Ensure that it is clean and that you have all your tools and materials at your work station to begin. 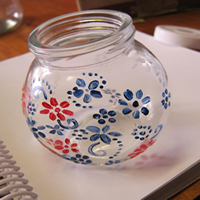 Use your acrylic paint and small paintbrush to mark out your design on the glass jar. 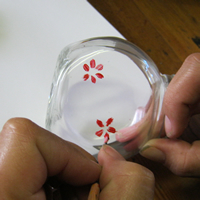 We have used red acrylic paint and a flower design for the first stage. The design that you choose is entirely up to you, it can be a free hand design or a design copied from something you have seen. 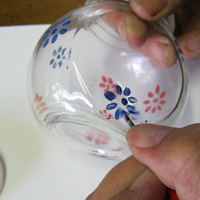 Continue painting the design onto the glass jar, all the way around the jar. 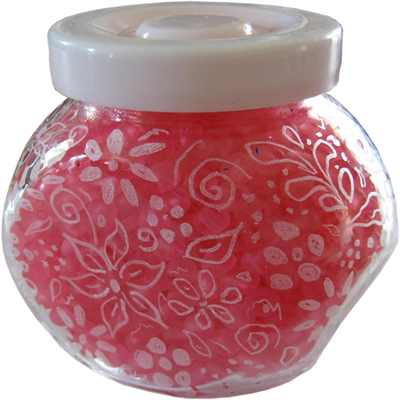 We found that a full design which covers the entire glass jar works better for a small glass jar like ours. Also, the greater the design surface, the further you take that old glass jar away from its original purpose and it can start living it's new life as an upcycled item! With the recycled glass jar covered in your acrylic paint design, you need to allow this sufficient time to dry prior to starting your work with the Dremel rotary tool. You should not have to wait too long as acrylic paint dries quite quickly. You should also rinse and clean your paintbrush in the container with water as soon as you are done. Attach the grinding stone tip to your Dremel rotary tool and then plug it in. 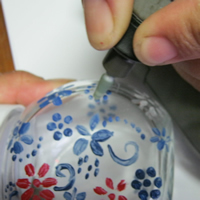 Holding the glass jar firmly with your one hand, use your other hand to grip the Dremel rotary tool firmly and begin to follow the design already marked out in acrylic paint, grinding to etch it away. Work slowly and carefully, paying particular attention to the outer edges of your design so that you get a well defined picture with even grinding and etching. 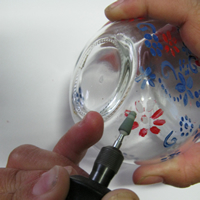 Work your way around the glass jar, etching and grinding until you have etched away every aspect of the acrylic design using your Dremel rotary tool. With the design now fully etched into the glass with your Dremel rotary tool, you can give the glass jar a quick wash before putting it to work! So simple and so effective, this little recycled glass jar has been given a complete breath of fresh air and a whole new life! Well done on your Upcycling! 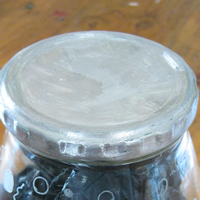 If your jar has a metal lid, please see the following two steps. As an added idea, if you are using a glass jar that has a painted metal lid, use your Dremel to either etch designs into the paint, or use it to remove the paint entirely, to give your recycled glass jar a completely different look, something much more rustic. 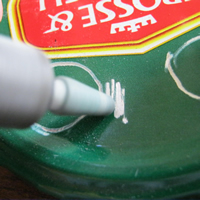 Once the paint has been removed, you can also use the Dremel to etch designs or zigzag patterns into the metal lid, adding texture creating an old World feel. Here is the end result of a seperate Dremeled Glass Jar project we did, with the paint etched off the lid and a bit of texture etched into the metal lid.